When North Korea captured a U.S. Navy electronic surveillance ship, the USS Pueblo, in international waters in 1968, it was perhaps the worst security breach in U.S. history. One of the potential responses to North Korean aggression, drafted and approved by top military officials, was nuclear war. The USS Pueblo was positioned in international waters (this is disputed by North Korea, of course) in January of 1968, using electronic means to intercept North Korean signals and messages. On January 23rd, North Korean ships opened fire on the Pueblo, which tried and failed to flee. The captain surrendered, and both the crew and ship were captured. That the crew were held (and tortured) for a year was bad enough, but the ship held an enormous amount of U.S. intelligence data. Worst of all, it held several devices used to decode encrypted U.S. military messages. Much later, the Navy would learn that the loss of the devices was compounded by the fact that the infamous Walker Spy ring was at the time already selling codes and other information to the Soviets. The result of all this was a tense period during which the U.S. tried to figure out what the North Koreans were up to, the extent to which the U.S.S.R. and China were involved, and whether North Korea was planning an invasion of South Korea. During this same period, North Korean commandos were crossing the DMZ to attack targets in the south, including an attempted attack on the South Korean president's house. It wasn't quite Cuban Missile Crisis tense, but there were some white knuckles in the war room to be sure. Diplomacy won out, with the U.S. basically waiting out the crisis until the Koreans released the prisoners, with some diplomatic help from the Soviets. Military aid to South Korea was increased, and the practice of leaving spy ships unarmed and alone while monitoring potentially hostile targets was brought into question. Today the USS Pueblo is a floating museum in Pyongyang – they gave back the crew but not the ship. 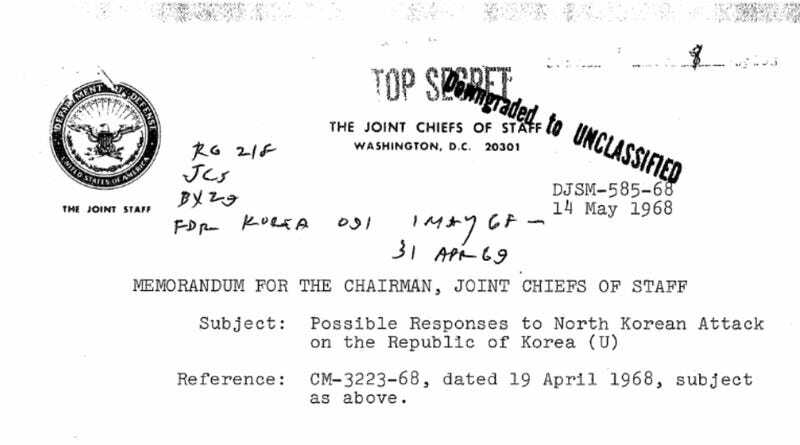 Recently declassified documents reveal the U.S.'s contingency plans, both for dealing with the capture of the Pueblo and for responding to a hypothetical North Korean invasion. The military's view of the situation was somewhat less diplomatic (which is their job, after all). They wanted to send a bunch of ships to Wŏnsan to flex their muscles and intimidate the North Koreans, but U.S. forces were a bit preoccupied in 1968, what with the Vietnam War and all. No ships were sent. The Joint Chiefs of Staff then considered invading North Korea, bombing the living hell out of them with B-52s until their air force was simply nonexistent. Then the land troops would move in. Analysis showed that China and the U.S.S.R. were very likely to intervene in some way. The plan accounted for this. However, this plan would have required the U.S. to pull out of Vietnam almost entirely (it required 12 divisions of troops and 40 tactical bomber squadrons). In all they developed five military plans to deal with the situation, varying in timing and specific troop disposition. These plans were called Fresh Storm. Then there was the nuclear plan, called Freedom Drop. It was developed by CINCPAC, the commander of the Pacific Fleet, who at the time was Admiral Ulysses S. Grant Sharp (Sharp was succeeded later in 1968 by Admiral John S. McCain, Jr., father of Senator John McCain). The Chairman of the Joint Chiefs of Staff approved the plan, so the potential responses included all-out nuclear war against tactical military targets – the Joint Chiefs delayed informing Sharp of the approval, however. You can see the documents themselves at the National Security Archive, hosted by George Washington University. Tip of the hat to Mark Strauss of Smithsonian Magazine, whose tweet this morning pointed me to the documents. The documents were uncovered by Jack Cheevers in researching his book Act of War. On a somewhat related aside, the general of U.S. forces in South Korea at the time was a Rhodes Scholar who wore a patch over one eye. His name? General Charles H. Bonesteel III.